When we see the state of things around us, and encounter problems for which we do not have, a solution, it is good to hear the Lord saying to us, "Come up higher! Come and see things from My standpoint - and not from the low earthly level from which you have been looking at these things". This is a word that we need to hear constantly - "Come up higher!" God needs men today, who will stand before His face and hear His voice daily; men who have no desire in their heart for anyone or anything other than God Himself; men who have the discernment of the Spirit to distinguish between the soulish and the spiritual authority; men who will stand alone for God in the world, if need be; totally uncompromising men, like the apostles and prophets of old. I'd like to turn to the Word of God in Revelation Chapter 4. After the Lord had given John a revelation of Himself in Chapter 1, He gave John an insight into the actual state of many of the churches in that part of the world - in Chapters 2 & 3. As you know, many of those churches were in a very backslidden state. Then the Lord said to John in Chapter 4:1: "Come up here!". What a lovely word that is! "Come up higher! Come and see things from My standpoint - and not from the low earthly level from which you have been looking at these things". I believe this is a word that we need to hear constantly - "Come up higher!". Paul said, "One thing I do - forgetting what lies behind, and reaching forward to what lies ahead, I press on toward the goal for the prize of the upward call of God in Christ Jesus". He had heard the call to come up higher and he was never satisfied, no matter how high he had reached. "We need to get closer to the heart of God! We need to go up higher!" God did not create Adam because He needed a servant. He did not create Adam because He wanted a scholar. And He did not create you and me because He needs servants or scholars. He already has enough servants in the millions of angels. He created Adam first of all that Adam might have fellowship with Him. That's why, for Adam, the law was NOT: "Six days you shall work and the seventh day you shall rest". No. That came through the Law of Moses later. Adam was created on the sixth day. And so his very FIRST day - the seventh day for God but the first for Adam - was a day of rest and fellowship with his Creator. It was from that day of fellowship with God that Adam was to go out into the garden and serve God for the next six days. And when we forget that order - when we forget that fellowship with God must always take precedence over our going out into His vineyard to serve Him - then we've missed the primary purpose of our creation and of our redemption. We can be so taken up with the need around us - and especially in a country like India - that we have no time for fellowship with God. We may feel that's a waste of time, when there is so much need around us. But what is the result of need-based work? Perhaps plenty of work - but the quality will be poor. Statistics are deceptive. You've probably heard the statement that there are three types of lies - black lies, white lies and statistics!! Statistics are deceptive. The Jehovah's Witnesses have statistics, the Mormons have statistics. And these are among the fastest growing groups in the world today. Islamic fundamentalists have their statistics too. Everybody has statistics these days. But Jesus never bothered about statistics. There are times in my life when I have been through certain crises. One was very early in my life when I sought to serve the Lord and I found that although I knew the Word, I lacked power! And so I sought God for the baptism in the Holy Spirit - to be endued with power from on high. Now, I know there are different views on this - and I am not trying to convert anybody. I am just saying that I was born again and baptized in water, but "rivers of living water" were not flowing out of my life. Yet I knew that Jesus had promised that everyone who believed in Him would have rivers of living water flowing out of their life - they'd never be dry. But I found myself dry, many times. Even though I knew the Word, and even though I was preaching, I was dry. Very often my service for the Lord was like pumping a hand-pump. You know what that means - you pump and pump and a few trickles of water come out. It is certainly not like a river. Yet I saw the word of Jesus clearly: "Everyone who believes in Me, out of his innermost being will flow rivers of living water". All I can say is that I sought God and He met with me. And that changed the direction of my life. I didn't join the Pentecostal church. I do not consider myself to be a Pentecostal or a charismatic. But God met with me and filled me with His Holy Spirit. And then years later, I came to another crisis in my life. That was a crisis that dealt with the issue of reality - whether what I was preaching was actually true in my inner life, and whether the burden that I appeared to have when I spoke to people was something I really carried in my heart as well. It was nearly 28 years ago that we had the first All-India Congress on Evangelism at Deolali. I presented a paper there. I was young then - just 30 years old. And you know how it is when we are young. I wanted to impress everyone. And my paper was impressive, because I had worked hard on it. My ministry continued with travelling to speak at deeper life conferences in Australia and Singapore etc. And everywhere, my aim was to impress people. Then the Lord spoke to me once and asked me, "Do you want to impress people or do you want to help them?" I said, "Lord, I want to help them". Then the Lord said, "Stop trying to impress them then". I came to a place then in my life, where I had to say, "Lord, my inner life does not correspond with what I am preaching". Externally, I had a good testimony. But my thought-life and my attitudes - my attitude to money - were not Christ-like. I was proclaiming Christ with my mouth but the Spirit of Christ was not ruling my thoughts. And I was honest about it with God. I believe that the first step to God is to be honest. By then I was fairly well-known. I was writing books that had a wide circulation. I had a weekly radio programme. I was invited here and there. One day the Lord spoke to my heart and said, "Are you willing to stand up in front of that congregation that respects you and tell them that you're not genuine, that you're not real". I said, "Yes, Lord! I don't care what people think of me. I want you to do something for me. I ask you only for one thing: That my inner life will correspond with what I preach". That's what I asked the Lord for 23 years ago. God met with me again. He is a rewarder of those who diligently seek Him. And the Lord said to me, "Come up higher". Fellowship with God has now become the most precious thing for me - during the last 22 years. It has changed my life and taken away discouragement and depression from my life altogether. I have found the secret of walking with God. And that's made my service joyful! It is no longer dry! All your service depends on your personal walk with God. You remember when Jesus was in the house of Mary and Martha. He said to Martha, "You are worried and bothered about so many things". What was Martha worried about? There was a need there. And she was serving the Lord, unselfishly and sacrificially, sweating away in the kitchen - not cooking food for herself but for the Lord and His disciples. What greater service could she do than that? It was totally unselfish! And she didn't do it for money or for a salary, as many Christian workers serve today. No. It was totally unselfish! And yet the Lord told her, "You are bothered about so many things". She had thought that Mary was selfish, sitting there at the Lord's feet and not doing any work, but just listening. And Jesus said, "That's the important thing. That's the ONE THING needful". The most important thing about a servant is that he does just what his master tells him to." That has brought so much rest to my heart. What am I to do when I see a needy world? Get all worked up with the need? There are plenty of manipulators in Christendom who are ready to work me up. But I say to the Lord, "I want to hear You". There are plenty of Marthas who will criticise me, saying, "Tell him not to waste his time listening, when there's a needy world perishing in sin." We must certainly look at the world's need. Jesus said, "Lift up your eyes and look at the harvest". We must see the need and we must point out the need to others too. Yes. But the call must come from God - not from man. I have discovered that. Jesus sat in heaven for 4000 years while the world lay dying in need of a Saviour. Nobody could pressurise Him to leave heaven before the Father's time. But "in the fullness of time", He came. And when He came to earth, He sat making stools and benches for 30 years - while the world lay dying! He would not be moved by the need alone. But when the right time came, the Father said, "Go". And He went. And He did more in three-and-a-half years than others could do in 3000 years. The most important thing about a servant is NOT running around doing this, that and the other for God, but listening to Him. It's difficult to listen. I used to be in an assembly in my younger days where we studied the Scriptures, and fasted and prayed regularly. Every morning we were taught to have a "Quiet Time" - a good habit that I would recommend to everyone. But in spite of all the hours apparently spent in the presence of God, people were still sour, bitter, hard-to-get-along-with, judgmental, critical and suspicious.... Something was wrong somewhere. I have known times when I have spent just 10 or 15 minutes with a godly man, and I have been challenged and inspired. Can you imagine then what spending 10 or 15 minutes with God Himself can do? How is it then that all of us were not being changed? The Lord showed me that I was not spending time with Him in my Quiet Time. I was spending time with myself. I was just studying a book - whether the book in front of me was the Bible or a chemistry book didn't make a difference. I wasn't spending time with God - listening to Him. I was just studying a book! Jesus said concerning Mary, "One thing is needful....o listen". From that flows everything else. And that's a very efficient way of serving God because He can tell you what He wants you to do! The Father told Jesus what to do. Once Jesus was prompted by the Spirit to walk 50 miles from Galilee to Syrophoenicia, outside the borders of Israel. I don't know how many hours it took Him to get there - probably a whole day. There He met a Gentile woman, whose daughter was demon-possessed. He cast out that demon and pointed out to His disciples the great faith that woman had when she asked for just the crumbs that fell from the children's table. Then He walked back to Galilee. That was how Jesus lived. He went all that way for just ONE soul. That wasn't impressive - statistically!! But it was in the will of God. Jesus served like that for three-and-a-half years. And at the end of that period He said, "Father, I have finished the work which You gave Me to do" (John 17:4). Had he met all the need there was in the world - in India, in Africa? No. He hadn't. But He had finished the work the Father gave Him to do. And He did not desire to live on earth for a single day longer The apostle Paul too could say at the end of his life, "I have finished my course". You have a different calling and I have a different calling in Christ's Body. But we must all understand what God wants us to do. One of the main reasons for our becoming deaf to the voice of God is the unreality there is in our lives - the dishonesty and the pretence. The Pharisees could not hear what Jesus was saying because they were living a life of pretence. They gave others the impression that they were godly. They stood up there in front of the people as the leaders and scholars of their time. If you had met Peter or John, four or five years before they had met Jesus, and asked them, "Peter, John, could you tell me the name of some godly man whom you know? ", they would have mentioned the name of some Pharisee who was an elder in the local synagogue. Because that was their understanding - that people who studied the Scriptures, fasted, prayed, carried little boxes of Scripture-verses on their foreheads and looked so holy and pious, were truly godly people. Then you can imagine the shock they got when they heard Jesus lambasting those elders in the synagogue as a bunch of hypocrites who were candidates for hell. When Jesus selected His disciples, he did not select even one from any Bible-school. There was a Bible-school being run by Gamaliel in those days in Jerusalem. But Jesus didn't go there to select His disciples. He picked them up from the lakeside in Galilee - uneducated men - and made them His apostles. And they wrote books, which Bible-seminaries now give to people to study, for a doctorate in theology!! Isn't that amazing?? I think Peter himself would not have been capable of getting a degree from any of our seminaries. Perhaps only one of the disciples would have been able to get such a degree - Judas, the cleverest and smartest of the lot. Why did Jesus pick such people? They were simple-hearted and willing to listen to Him. What a stir there was when these simple men went to any synagogue and preached. They did not preach the routine messages that the people there had always heard. They were prophets. And people have never liked prophets. In the 1500 years of Israel's history, as Stephen said, "Which of the prophets did they not persecute?" Those apostles were not diplomatic speakers. They were prophets. And I believe that our country could do with a few prophets at this time, so that we could hear what God is saying. God doesn't care for that which is big and great in the eyes of men. I am not against meetings like this. But I stopped going to such meetings more than 20 years back. I turn down such invitations now. I know that such meetings can make you famous. You get media exposure. But I have discovered as I have travelled in the villages of our land - where most of my ministry is now - that the people who do the real work are not at a conference like this one. They are unknown and out there in those villages. They can't speak English and they certainly don't know what it is to present a paper. But they are filled with the Spirit, they love the Lord and they go out and bring lost souls to Christ. Praise God for such people. Others organise their missions and become known as mission-leaders and get the honour. But many who are first now will be last when Jesus comes back. So it is good for us to be humble. It is good for us to have low thoughts about ourselves. Perhaps we are not so great in God's eyes as other Christians think we are, because of our degrees and our titles. These may impress men, but not God. In fact they don't impress the devil either. The devil fears a holy man, a man who is genuine, a man who is the same inside as he is on the outside, and a man who never preaches what he does not practice. People ask me, "Brother Zac, why don't you urge people to go to North India?" I reply, "Jesus taught only what He first did" (Acts 1:1). I haven't lived in North India. So I cannot tell others to do it. I'm not saying that it should not be done. I'm only saying that I cannot preach what I haven't done. But then I'm not the whole body of Christ. I'm only one part of it. I am an imbalanced member of the body of Christ. I will always be imbalanced. The only balanced man that ever walked on earth was Jesus Christ. You are imbalanced and so am I. Let's not think that any one of us is more than just one part. Every part is needed - the evangelist, the teacher, the shepherd, the prophet and the apostle - for people to be made members of the body of Christ and for that Body to be built. What is our calling? It is to make someone who is not a member of the Body of Christ a member of that Body. Isn't that our calling basically? I think we'll all agree on that. Since the Holy Spirit uses the word, "Body", let me use an illustration from the physical body. Let us say there is a plate here, with a potato (representing an unbeliever), that has to become a member of my body. How does that happen? It happens first of all through evangelism - the hand reaching out and taking that potato. Evangelism is always the first ministry in this task. That is why I never devalue evangelism. I value it very highly - and especially those who are engaged in this ministry in the heat and dust of North India. I am interested in reading their magazines - I get a number of them in my home - to read about the ministry of these dear brothers of mine who are labouring there. I have been up there now and then to meet some of them too. Here then is my hand taking the potato from the plate. That potato will never become a part of my body if the "evangelist" (my hand) does not go out and do "evangelism" (put the potato in my mouth) . But is that all there is to it? If I just keep that potato in my mouth, will it become a part of my body? No, it won't. After a while it will get rotten in my mouth and I will spit it out. That is how some converts get rotten in some of our churches! They are taken in and kept inside the mouth! But something more has to happen to that potato. It has to be chewed and crushed by my teeth. The potato can then imagine that everything is over. But all is not over! The potato goes down to my stomach, and there finds that acids are mercilessly poured on it. That is a picture of prophetic ministry in the church. You know it's not comfortable when acid is thrown on us. The gentle ministry of being picked up from the plate was so nice. But when acid is thrown on us, that is far from pleasant. The potato is now broken down completely and it no longer looks like a potato. But in a few weeks, lo and behold, it has become blood and flesh and bones - a very part of my body! Now, whose job was the most important in this task. What ministry do any of us have that we did not receive? If we are humble, we will confess that we are imbalanced. The hand is not more important than the stomach. They complement each other. Unfortunately in Christendom there is this perpetual competition between the members - the hand building its own kingdom, the stomach building its own kingdom, and the mouth building its own!! What do we have then? Not a body, but an "Anatomy Laboratory", with a mouth over here, a stomach over there, a hand here and a leg there. That's not a body! What do we need most of all? Yes, it is true we need instruction. But we need humility more than anything else. We need to recognise that we are all equally important - every member in Christ's body. And the great mission leader is no more valuable in this ministry than the poor brother who can't speak English properly, but who goes out and brings souls to Christ. They are all part of the same body. "Come up higher", the Lord says, "and look at things from My viewpoint." Things look very different when viewed from God's viewpoint than from an earthly viewpoint. Why is it that so many Christian workers have such a high opinion about themselves? Be honest. What are the thoughts you think about yourself, when you are all by yourself? Are they thoughts of humility, recognising that you yourself are nothing? There are times when I sit outside and look at the stars. I know there are millions of stars and that the whole earth is just a tiny speck in this universe. And I say, "O God, how great You are! How great this universe is! I am such a small little speck of dust on this speck called Earth. And here I am claiming to represent You and preaching such great matters. Please help me to have a sober estimate about myself." I would recommend that all of you say that to God. God gives grace to the humble. Anybody can have knowledge. But only the humble can receive grace. We need grace far more than we need knowledge. I have thought of the young people who come to the Lord and who are persecuted by their families for their faith. When such a person comes to one of our churches, what does he see? Does he see the spirit of Jesus Christ there? People around us have such a wrong impression of Christianity. I've long believed that the first principle of all effective ministry - whether evangelism or whatever - is found in Hebrews 2:17, where it says that Jesus "was made like His brothers in all things". I want to meditate on that - He was made like His brothers in everything. How can I serve others? I have to be made like them in everything. I have to descend to their level. Why is it that I cannot communicate with a little ant crawling on the floor? Because I am too big. If I go to that ant in human form, it will be terrified. The only way I can communicate with that ant is by my becoming like it first of all. The only way that God could communicate with us was by His becoming like us. We can all understand that. But let us remember that in our ministry to others too - whether in a local church or in an unreached area - the first principle is this - to be made like them in all things, "to sit where they sit", as Ezekiel said (Ezekiel 3:15). That means, for example, that we don't want to exalt ourselves above others in any way. This was why Jesus told His disciples never to take any titles like "Rabbi", "Father", or any other title. Because a title will exalt you above the people whom you serve. You will overawe them with your greatness, instead of being one like them. In spite of such a warning, we still have lots of people with titles in Christendom today. We think we can serve God better by adopting the methods of the world. But that is just not true. In the Old Testament, we read that the Philistines captured the ark of God once. But they had a problem with it, and so they sent it back on a bullock cart. Years later when David was about to move the ark, he thought, "Hey, that's a good idea. The way that the Law taught, of the Levites carrying the ark on their shoulders, is all right for short distances. But for long distances, the Philistine method is certainly better." And so he too put the ark on a bullock cart. And you know what happened. The oxen stumbled and Uzzah stretched forth his hand to steady the ark. God was angry and smote Uzzah dead on the spot, because he was not a Levite. God wouldn't change His methods. Then David was greatly disturbed. But where did it all begin? It began with David imitating the Philistines. And death came in. Death always comes in when we imitate the ways of the world, when Christian churches are run the way business enterprises are run, and when money becomes the Number One factor in Christian work. A good question we could ask ourselves is whether the church or organisation that we are running will survive, if all money stops coming in. Or will the whole thing come crumbling down then? A true work of God may use money but will never be dependent on money. It will be dependent only on the Holy Spirit. The Bible says that the Spirit is jealous (James 4:5) - jealous when something else or someone else takes His rightful place in the church. It could be music. I'm not against music. I believe we should have the best possible music in our churches, without imitating the world. But we must not depend on music. For example, at the end of a meeting, if we think that by getting the organ to play softly, we can move people to make a decision, what is that? It is psychological manipulation, not Holy-Spirit power. If the Word of God is preached in the power of the Spirit, like Jesus preached it and like Peter preached it, you won't need any organ playing softly at the end. You can have it if you like, but it's not going to help. But if you haven't got the power of the Holy Spirit, then you will have to manipulate people psychologically to make them take a decision. But you will discover in the long run that such decisions are only emotional and superficial. The Holy Spirit is jealous for His rightful place in the church. You can't replace Him with theology. You can't replace Him with music. You can't replace Him with money. Thank God for all these things. Use them all. Jesus used money. So how can we be against it. It is written that Jesus sang a hymn. In Hebrews 2:12, we read that Jesus Himself is the One Who leads the church in praising the Father. So when we praise God, we are only following our Leader. So how can we be against music. We are not against any of these things. But it's a question of what we depend on. Do we depend on great personalities or great preachers? No. The Holy Spirit is jealous. Jesus became a servant. 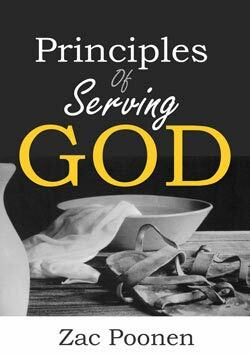 Every Christian leader speaks about a servant life-style and being a servant and many books are written about it too. But what does it mean in practical terms? Let me ask you: How do you treat your coworkers? How do you treat your junior-most coworker, who joined your group just yesterday? Is he really a brother to you or does he live in awe of you? If so, then even if you preach about servanthood until doomsday, I'd say you haven't understood it. You haven't seen Jesus. Jesus was so simple. He never overawed people. He said, "I am a son of man" - and that means, "an ordinary man". He was the pure and holy Son of God Who had lived from all eternity with the Father. But He came and lived on earth as an ordinary man. He became like His brothers in all things. For us to become like our brothers in all things, something in us has to die. It says about Jesus that "He humbled Himself to the point of death". Death is the perfect proof of our humility. Whom have I in heaven but Thee and there is nothing and no-one I desire on earth beside Thee (Psalm 73:25). There are times when I lie down on my bed and say to the Lord, "Lord, my ministry is not my god. You alone are my God. Nobody will ever take Your place. You are everything to me. You can take away my voice, paralyse me or do whatever you like with me. I will still love You with all my heart." Nobody can take away my joy - because in God's presence there is fullness of joy. It is from that fount alone that the rivers of living water can flow through us. One last thing: Many, many years ago, when I was a young Christian, the Lord spoke to me from 2 Samuel 24:24, where David said, "I will not offer to the Lord that which costs me nothing". What the Lord spoke to my heart that day was that when He came to earth, He had offered that which cost Him everything. And if I was going to serve Him, I would have to serve Him in that same spirit. Every service of mine must cost me something. How is it with your service for the Lord? Has it cost you something? We have many people in Christian work in India today, who are earning five to ten times what they would have been earning if they had been in a secular job. I made a decision when I quit my job in the Indian Navy, 31 years ago, that I would never receive any money that would raise my monthly income to more than what I would have earned in my secular job. That decision has preserved me for 31 years. We don't have to judge others. And I am not here to judge you. I don't know many of you and so it is easy for me to say this: Ask yourself what you would have been earning today if you had been in a secular job. John Wesley used to tell his co-workers, "Let it never be said that you have become rich by preaching the gospel." Do you know where Christian work suffers the most? Right here, in this area. You cannot serve God and money. That's the issue that we need to deal with first of all. We can spend our time here talking about every other subject under the sun. But if we don't deal with this problem of the love of money, all our service will be useless. People relocate their residence from one place to another. There is nothing wrong with that. Jesus also relocated His residence from heaven to earth. But when He relocated, it was a step down. And it was because He had a genuine concern for people here on earth. Again I'm not judging you. I'm only asking. Did you relocate your residence, because you felt that from your new location you could serve the Lord more effectively in India - the land for which you seem to have such a great burden? Do you have a genuine burden? Can we live in the comfort of South India and have a burden for the villages of North India? Maybe you can. But I don't see how I can do that myself. Can you live in the United States of America and have a burden for India? Yes - but only on paper. On paper you can have a burden for anything! The devil is a great deceiver. He deceives us thoroughly. He makes us feel that we have a great burden for something when in actual fact we have nothing but hot air!! I'm not presenting a paper here. I'm sharing my heart. And I hope it is God's heart too. I'm not judging you, my brothers and sisters. God told me years ago, "If you judge others you will destroy yourself." I stand before God today and say that I'm not judging anyone. I judge myself. And I repent. My life is one of daily repentance - because I see un-Christlikeness in many areas of my own life. I repent and say, "Lord, I didn't speak kindly to that person. I want to learn how to speak". The man who cannot control his tongue - his Christianity is worth zero, as James says (James 1:26). And I want to keep that verse before me always. Paul said something about his coworkers once. When he was looking for someone to send to Philippi, he said he could find only Timothy, because all the rest who were with him then, were seeking their own!! (Philippines 2:19-21). Note that Paul did not say this about the heathen but about some of his coworkers. Getting on to Paul's team itself was an honour, for Paul was the type of person who would not permit even a John Mark to continue on his team, because he felt John Mark was not radical enough. Yet Paul felt that most of his coworkers were seeking their own. Today, many are preaching the gospel and appear to be burdened for souls, but they are really seeking their own gain and comfort. They are promoting themselves. They are promoting their children and their family members - to take over their work when they retire!! Saul also wanted to promote Jonathan. But God said, "It's not Jonathan but David who has to take over as the next king." That made Saul furious and he tried to get rid of David, in order to promote his own son. Do you think that such things are not happening in Christendom today? They are. When we serve the Lord and speak the truth, we are not going to be popular. But if we seek to please men, we cannot be servants of Christ. I want to thank God for every brother and sister - and especially for those who labour in difficult situations, who have made sacrifices that we will not know about until Jesus comes again, who are not known in Christian circles, whose names are not heralded and who have no media coverage, but who are God-fearing, humble people, sacrificially spreading the gospel of Jesus Christ in our land. I want to salute them. I praise God with all my heart for such people. I stand nowhere, when compared to any of them. Many of them are working in our churches and our organisations. Let us follow in their footsteps. God's work in the world suffers today, because such men are few in number. Determine with all your heart that you will be such a man for God, in the midst of a sinful and adulterous generation and a compromising Christendom. Since there is no partiality with God, it is possible for you too to be such a man, provided you yourself earnestly desire to be one. Since God demands commitment and obedience only in the conscious area of one's life, it is possible for you to be such a man, even though the conscious area of your life may be limited. (That area will keep increasing as you walk in the light and press on to perfection). There is no excuse then why you cannot be such a man. Since nothing good dwells in the flesh, we have to seek for grace from God to have the virtues listed above. Cry out to God daily then, that He will give you grace to be such a man in these the closing days of the age.